These step-by-step tips from Yan-Kit's Classic Chinese Cookbook will give you all the skills you need to achieve perfect results every time you stir fry. 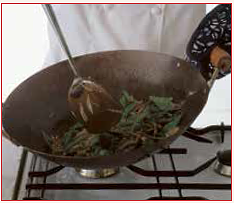 Stir-frying is the unique contribution of the Chinese to world cooking. 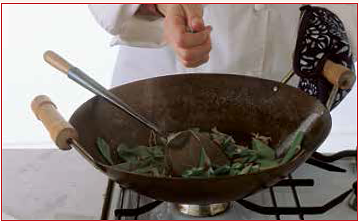 When cooked with this method, meat is tender, vegetables are crisp, and they both have a unique fragrance. Because speed and instant control are essential, gas is preferable to electricity (cooking also takes longer on an electric burner). 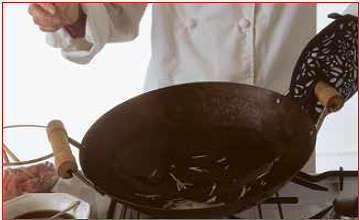 In Chinese cooking there are two types of deep-frying. In one, the ingredients are deep-fried until crisp and cooked through; in the other they are deep-fried just long enough to seal in their juices. 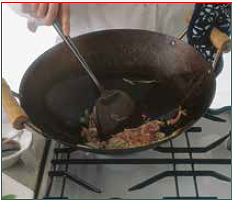 This is known as “going through the oil”, and is a preparatory step to the sophisticated stir-frying invariably used in Chinese restaurants. 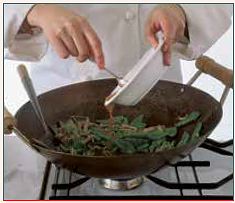 Although it produces a more refined result in certain dishes it is not essential for everyday cooking. 1. 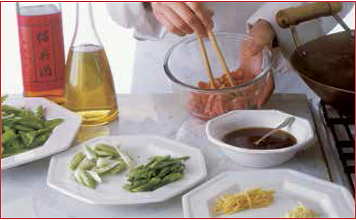 Stir-frying is a very quick cooking technique so prepare all the ingredients before you start. Add the marinade to the main ingredient and stir well. If oil is to be added, blend it in last. 2. Heat the empty wok over a high heat until smoke rises (you may also notice a slight blue/rainbow effect at the bottom). 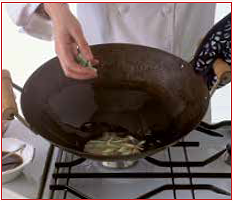 Heating the wok before adding the oil prevents the meat or fish from sticking. 3. 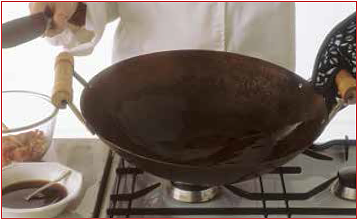 Gently add the oil (usually about 45–60ml [3–4tbsp]), and swirl it around to coat half way up the side of the wok. 4. If you’re using garlic, add this to the oil. 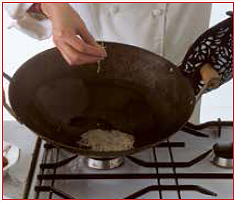 Steady the wok with a gloved hand as you do so. 5. As soon as the garlic has started to sizzle and take on colour, add the ginger. Stir. 6. As soon as the ginger starts to sizzle add the white part only of the spring onion (the green part needs less cooking and is added later). Stir well. 7. Add the main ingredient (meat, fish or shellfish). 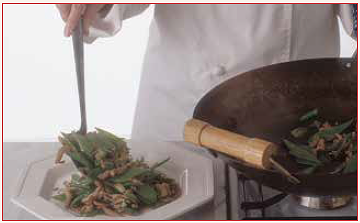 Slide the scoop under the food to the bottom of the wok; turn and toss until the food is partially cooked. 8. 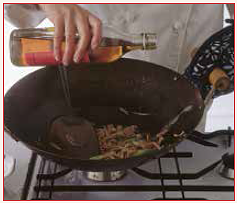 Splash in the wine or sherry around the side of the wok and continue to stir until the sizzling subsides. 9. Add any other ingredients which need heating or reheating and stir and toss. 10. 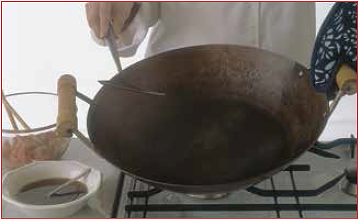 Make a well in the centre of the wok and pour in the well-mixed sauce. Stir until the sauce has thickened and turned glossy. 11. Add the green parts of the spring onion which need the least cooking. Stir and toss briefly. 12. 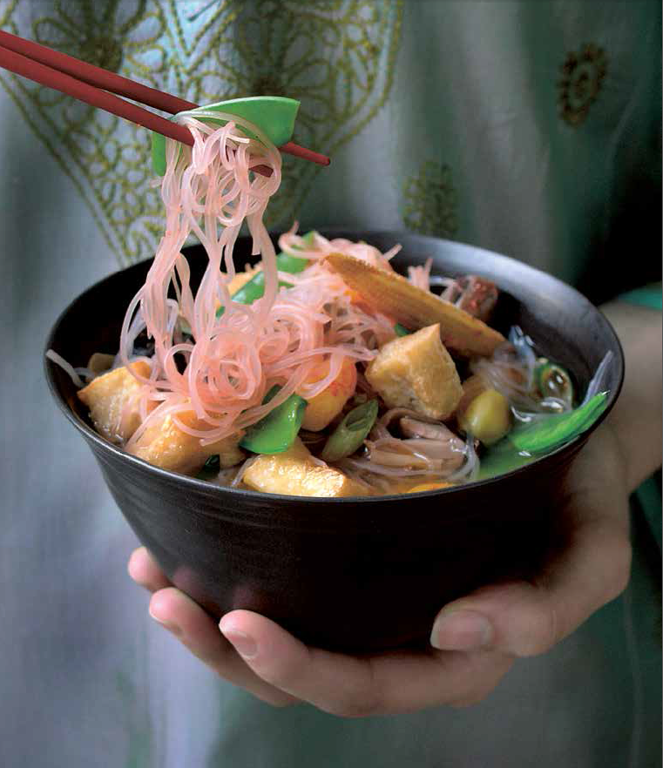 Scoop out the stir-fried ingredients on to a warm serving plate. Serve immediately. 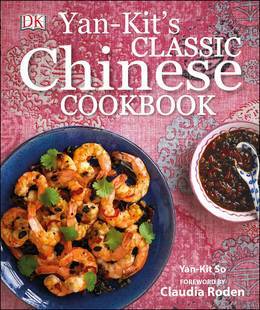 Yan Kit’s Classic Chinese Cookbook. This visual guide demystifies the art of Chinese cookery and gives you the foundation to create over 140 mouth-watering dishes. 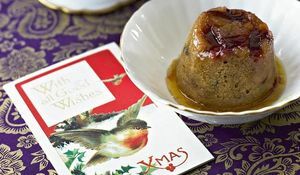 Let's be honest, as wonderful a tradition as it is, Christmas Pudding isn't everyone's favourite way to top off a heavy Christmas meal. 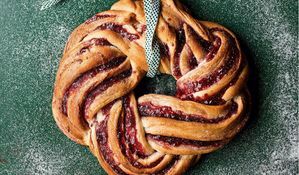 If you want to venture beyond the tradition Christmas Pud this year, look no further than these delicious alternatives. Tired of soggy, uninspiring sandwiches for lunch? 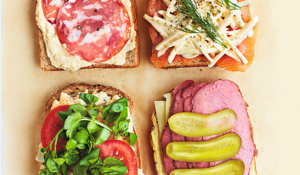 The Little Book of Lunch is here to save you, with a host of sandwich-making tips that will make eating al desko a pleasure.